“The insanity of these capitalists in pursuit of money knows no bounds… Capitalism has, in fact, become its own gravedigger.” Michael Hamlin in A Black Revolutionary’s Life in Labor: Black Workers Power in Detroit. 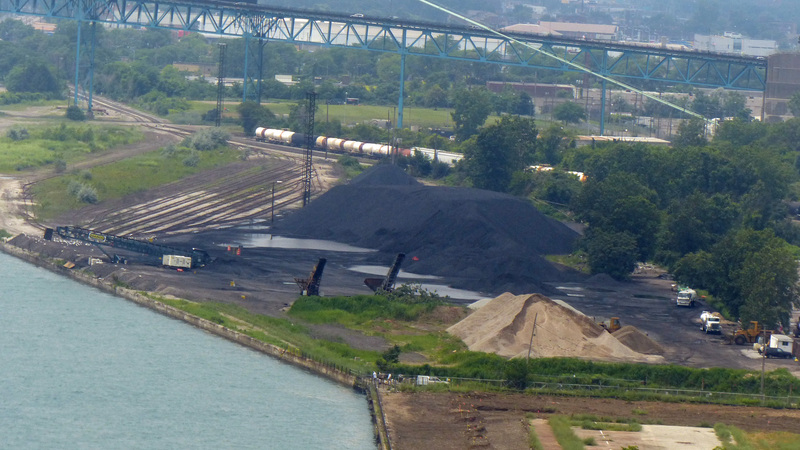 There is a growing mountain of black material, now three stories high and more than a city block wide outside our east window, courtesy of billionaire Manuel “ Matty” Moroun of Ambassador Bridge fame and the billionaire Koch brothers, owners of Koch Carbon, and Marathon Oil. The black material is petroleum coke, also known at pet-coke. Pet-coke is a by-product of bitumen from the oil tar-sands of Alberta, Canada, once thought to be waste. The tar-sands oil is shipped by pipeline to the Marathon Oil refinery in southwest Detroit which opened in November of 2012 to process the tar-sands. Once the oil is extracted, the waste product is shipped by truck to the banks of the Detroit River, just east of the Ambassador Bridge where it is loaded on ships bound for unregulated industries mostly outside the country where it is used as cheap fuel. The outcome is billions more for the promoters of this scheme. On two occasions over the past couple of weeks, I have taken photos as storms hit the piles of black waste sweeping it up on winds and rain spreading it throughout the nearby neighborhood or dropping it into the water after it goes airborne. I also grieve that this contamination of the waterfront lies in the path of the west Riverwalk and fishing park now under construction (see foreground of photo) by the Riverfront Conservancy forcing them to give up their plan to expand the people’s Riverwalk from Belle Isle to the Ambassador Bridge. Mike and I have joined a neighborhood group: Detroit Coalition Against Tar Sands (DCATS) to fight against this flagrant pollution of nearby neighborhoods and our precious water contaminated in the name of greed. Take a look at DCATS Facebook page for more information. The group, working with State Rep, Rashida Tlaib, has been successful in demanding a land use hearing, now scheduled at 10 am at the City County Building on July 31st. You will want to read Mike’s book for a better understanding of how capitalism functions to support greed without regard for others. by Mike Hamlin with Michele Gibbs. Do you have your copy yet? You may purchase Mike’s book on our website: www.againstthetidebooks.com/books/. To follow our blog, click “follow” on this website. Visit us on Facebook: Against the Tide Books. Copies of Mike’s book are available locally at SOURCE Booksellers in Midtown Detroit, BOOK BEAT in Oak Park and the Charles H.Wright Museum of African American History. Also available from Amazon.com and Barnes & Noble.com. This entry was posted in Uncategorized and tagged environment on July 20, 2013 by joanncastle.